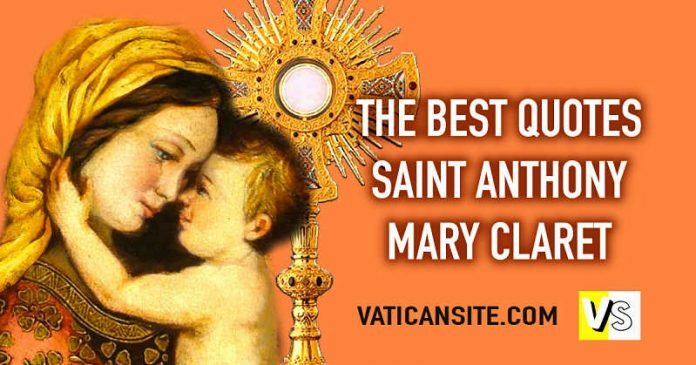 THE BEST QUOTES BY SAINT ANTHONY MARY CLARET Claretian archbishop and founder. 1-I will be kind to everybody, particularly to those whom I find troublesome. 2-Love is the most necessary of all virtues. Love in the person who preaches the word of God is like fire in a musket. If a person were to throw a bullet with his hands, he would hardly make a dent in anything; but if the person takes the same bullet and ignites some gunpowder behind it, it can kill. It is much the same with the word of God. If it is spoken by someone who is filled with the fire of charity- the fire of love of God and neighbor- it will work wonders. 3-Although the sinner does not believe in Hell, he shall nevertheless go there if he has the misfortune to die in mortal sin. 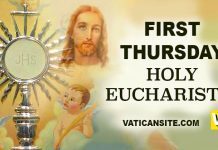 4-The faith I have when I am in the presence of the Blessed Sacrament is so strong that I find it impossible to express what I feel… When the time comes to leave I must force myself to overcome the inclination to prolong my stay with Jesus. 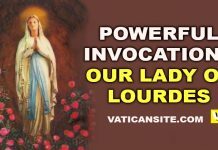 5-A son of the Immaculate Heart of Mary…is a man who unceasingly expends himself to light the fire of divine love in the world. Nothing stops him. 6-A multitude of souls fall into the depths of Hell, and it is of the faith that all who die in mortal sin are condemned for ever and ever. According to statistics, approximately 80,000 persons die every day. How many of these will die in mortal sin, and how many will be condemned! For, as their lives have been, so also will be their end. 7-Christian perfection consists in three things: praying heroically, working heroically, and suffering heroically. Claretian archbishop and founder. Anthony was born in Salient in Catalonia, Spain, in 1807, the son of a weaver. He took up weaving but then studied for the priesthood, desiring to be a Jesuit. Ill health prevented his entering the Order, and he served as a secular priest. 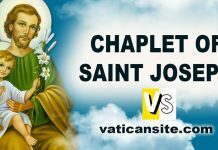 In 1849, he founded the Missionary Sons of the Immaculate Heart of Mary, known today as the Claretians, and the Apostolic Training Institute of the Immaculate Conception, Claretian nuns. From 1850 to 1857, Anthony served as the archbishop of Santiago de Cuba, Cuba. He returned to the court of Queen Isabella II as confessor, and went into exile with her in 1868. In 1869 and 1870, Anthony participated in the First Vatican Council. He died in the Cistercian monastery of Fontfroide in southern France on October 24, 1870. Anthony Mary Claret had the gift of prophecy and performed many miracles. He was opposed by the liberal forces of Spain and Cuba and endured many trials.